Writing is work. To those of us who like to write, it’s fun–but to actually be proficient at it, it takes work. 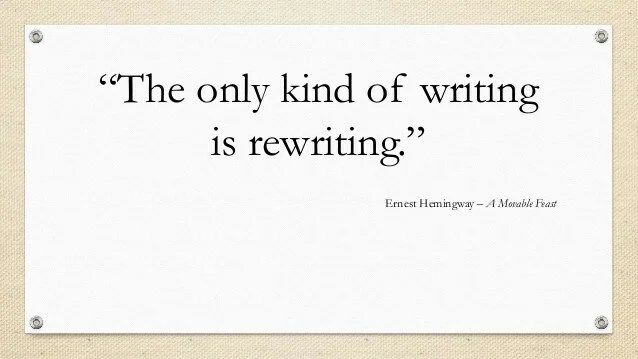 Why do we write? At its most basic, the reason is to communicate something–information, ideas, opinions. But we also want to entertain or at least stir some emotion or thought within the reader. So we throw words down on virtual paper (few of us use physical paper nowadays) and put it out there for others to read. Yet rarely do we go back and actually look at what we wrote, hence the plethora of misspellings and bad grammar that plague social media. Inherently, we as the human race tend to be lazy, especially if it’s regarding something we really don’t want to do. Students do the minimum for a grade when writing assignments. Facebook users sling random thoughts to their “friends” without bothering to punctuate or capitalize. Even those who profess to be Writers (with a capital W) tend to do a first draft, type “The End”, and relax in satisfaction for a project completed. It is so easy to believe that just because you have pressed keys on your keyboard that what you have written is coherent, eloquent, and engaging. Yet often, the end results are just the opposite. I admit that I have found myself writing a first draft and then believing it’s ready for the world to read. Even though I have taught others that writing is rewriting, it’s easy to set that belief aside when it comes to my own creations. After all, I’ve shared bits of my soul and used my skills to the best of my ability–surely I got it right the first time. When I do follow my own advice and put the manuscript aside for a period of time and then revisit it later, inevitably I will find awkward sentences, redundancies, weak word choices, and unclear ideas that need to be fixed. This is not the fun part, because I have to actually put effort into the writing process rather than just let the words flow as I did in the first draft. The problem is that when you let something flow, it often finds the path of least resistance to its destination if not outright splashing onto something you have to later clean up. I recently re-addressed a screenplay I wrote years ago. I still maintain that the story is solid and would make an excellent film; however I found some minor issues with formatting and grammar that took me a couple hours to go through and tweak. This wasn’t a major overhaul, and it certainly didn’t change any elements of the actual story, but these flaws now looked amateurish and sloppy to me. Whenever I have a new piece that I wrote, whether it’s a short story, screenplay, or article, I try to have other people review it first to make sure that I didn’t do something stupid. This is after I’ve already done two or three drafts. Criticism is often hard to take, because people always see things from a different perspective and quite frankly, sometimes people don’t know how to provide feedback. So I have to pick and choose the comments that make sense without being emotional about it–even if they’re talking bad about my babies! Ultimately, a writer needs to distance himself from his work. The first draft is the creation of its life, and by definition is an emotional experience. But the second, and third, and every other subsequent draft must be where the hard work is done. Conception is the fun part, but then you have the rest of your child’s life to teach him, and discipline him, and handle all the problems associated with rearing your offspring–even literary ones. That takes work. And hopefully, the enjoyment and the effort will pay off in the end.